The Antiochian-Greeks, also known as Levantine Rûm, are indigenous Arabic-speaking Christians of ethnic Greek origins native to the Levant, specifically residing in Turkey, Lebanon, Israel/Palestine, Jordan, and Syria. They may be deemed a subgroup of a much broad Helleno-Syrioi (Greco-Syrian) identity, which includes portions of the Muslim population throughout the Levant. 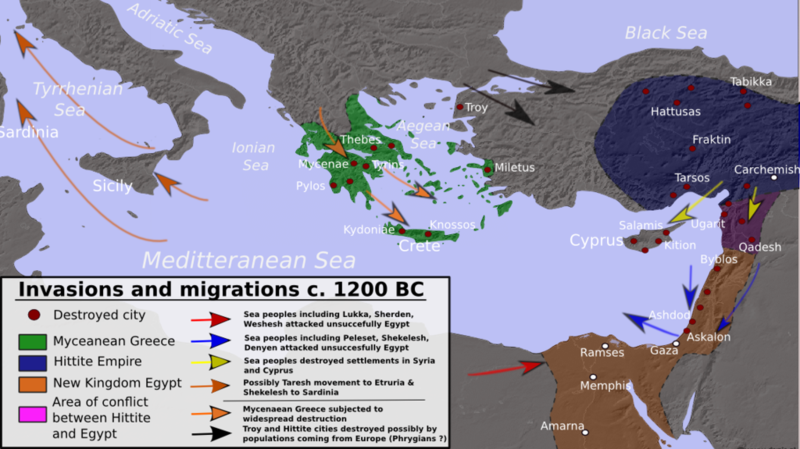 Modern Antiochian-Greeks are descendants of a mixture of ancient Luwians, Sea Peoples, ancient Greek settlers from the Hellenistic Age, Byzantine Greeks, Hellenized Syriacs, and survivors of the Ottoman Greek Genocide . Antiochian-Greeks have two popular ethnonyms. These two terms, Rûm and Melkite, were once interchangeable. However, today they’ve come to be used differently. The former is used by those associated with the Greek Orthodox Patriarchate of Antioch, while the latter is used exclusively by those associated with the Greek Catholic Patriarchate of Antioch. Rûm, also transliterated as Roum (in Koine Greek "Ρωμιοί", in Arabic الرُّومُ ar-Rūm, Persian/Turkish Rum) is a generic term used for the ethnocultural minority of former Koine-Greek speaking Christians living in the Middle East and their modern-day descendants. The word derives from the Greek, Ρωμιοί, a later form in Greek of Ῥωμαῖοι, Rhomaioi, i.e. "Romans"; it refers to the Byzantines. The Arabs, therefore naturally called them "Rûm", their territory "the land of the Rûm", and the Mediterranean "the Sea of the Rûm”. Therefore, the term literally means “Eastern Romans” or “Asian Greeks”. Melkite, also transliterated as Melchite, is also a generic term used for the ethnocultural minority of former Koine-Greek speaking Christians living in the Middle East and their descendants. The name derives from the Syriac word malkoyo, meaning "royal", and by extension, "imperial". The term was originally used as a pejorative term after the acrimonious division that occurred in Eastern Christianity after the Council of Chalcedon (451). It was used by non-Chalcedonians to refer to those who backed the council and the Byzantine Emperor. The Melkites were generally Greek-speaking city-dwellers living in the west of the Levant and in Egypt, as opposed to the more provincial Syriac- and Coptic-speaking non-Chalcedonians. There is no archaeological evidence of ethnic Greek settlements in the Levant during the Bronze Age. However, there are three archaeological sites, which do show evidence of an Aegean cultural presence (Tel Kabri  , Qatna, and Alalakh  ). This presence may have been some type of trade relationship between the Aegean and Levant; with Helladic pottery being found across the Levantine world   . The Ancient Levant has always been inhabited by a number of indigenous Indo-European and Semitic speaking peoples; the Canaanites, Luwians, Amorites, Mitanni. However, during the Late Bronze Age collapse the coastal regions came under attack from a collection of nine seafaring tribes known as the Sea Peoples. It was during this transitional period, which historians believe was a violent, sudden, and culturally disruptive time. That the Eastern Mediterranean witnessed the fall of the Mycenaean Kingdoms, the Hittite Empire in Anatolia and Syria, and the New Kingdom of Egypt in Syria and Canaan. 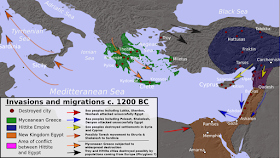 Among the Sea Peoples were the first confirmed ethnic Greeks to migrate to the Levant. At least three of the nine tribes of the Sea Peoples are believed to have been ethnic Greeks; the Denyen, Ekwesh, and the Peleset, although some also include the Tjeker. According to scholars, the Peleset were allowed to settle the coastal strip from Gaza to Joppa becoming the Philistines. While the Denyen settled the coastal plains of Pamphylia and Cilicia, as confirmed in the myths of Mopsus, as well as from Joppa to Acre. Some believe that a portion of the Denyen may have joined with the ancient Hebrews to become the Israelite Tribe of Dan. The political vacuum, which resulted from the Bronze Age collapse witnessed the rise of two distinct ethnic Greek civilizations in the Levant, the Philistines in the south and the Kingdom of Palistin  in the north. As well as the creation of the Syro-Hittite states, and Phoenician Civilizations, before the rise of the Neo-Assyrian Empire. The epic history of the Antiochian-Greeks traditionally begins with Alexander the Great’s conquest of the Persian Empire. In the aftermath of Alexander’s death, his empire was divided into several successor states, and thus ushered in the beginning of the Hellenistic Age. For the Levant, and Mesopotamia this meant coming under the control of Seleucus I Nicator, and the Seleucid Empire. The Hellenistic period was characterized by a new wave of Greek colonization  . Ethnic Greek colonists came from all parts of the Greek world, and not, as before, from a specific “mother city” . The mixture of different Greek-speakers gave birth to a common Attic-based dialect, known as Koine Greek, which became the lingua franca throughout the Hellenistic world. The main centers of this new cultural expansion of Hellenism in the Levant were cities like Antioch, and the other cities of the Tetrapolis Seleukis . The Seleucid Empire was a major center of Hellenistic culture that had a dominated Greek political elite within newly founded urban areas . 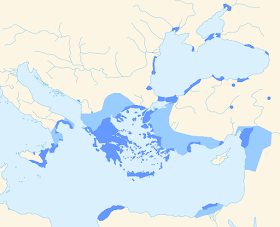 These newly founded urban areas were aided by the fact that the Greek mainland was overpopulated and therefore made the vast Seleucid Empire ripe for colonization. Apart from these cities, there were also a large number of Seleucid garrisons (choria), military colonies (katoikiai) and Greek villages (komai) which the Seleucids planted throughout the empire to cement their rule. 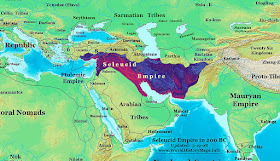 The Seleucids, in many ways, did not consciously promote a policy of Hellenization, and instead used the Greek Polis, to promote ethnic segregation between ethnic Greeks and local Aramaic-speakers . Within the Seleucid system, a polis was a community of citizens recognized as ethnic Greeks by the Seleucid Royalty and other Greek poleis. Each polis possessed a gymnasia, and trained in Greek culture (paideia). These Greek communities even held pan-Hellenic games, which strengthened their ethnic identity . 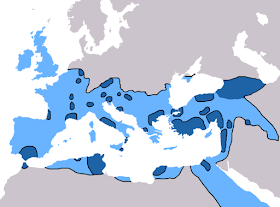 As a result, the Seleucids fostered the concept of a “Syriac ethnos”, in which all Aramaic speakers were included . These, Syriacs, were allowed to maintain social and cultural autonomy by developing their own communities within the Empire. This system of separate communities allowed Greeks and Syriacs to preserve the unique ethnic identities even when they inhabited the same topographic space . According to local legends, there were three established Greek settlements in the region of the future site of Antioch; Iopolis, Herakleia near the site of Daphne, and Kasiotis at the acropolis on Mount Silpius  . The initial ethnic Greek inhabitants of Antioch are listed as Athenians, Macedonians, Cretans, Cypriots, Argives, Heraclids, and the inhabitants of Antigonia . Levantine-Hellenism flourished under Roman rule in place like the Tetrapolis Seleukis, as well as the Decapolis and Isaurian Decapolis, which produced such famous Helleno-Syrioi as Apollodorus of Damascus, Eusebius, Hermippus of Berytus, Saint George, and Nicolaus of Damascus. Prior to the Roman conquest, the indigenous Helleno-Syrioi were divided between three states; Seleukeia and the Greco-Armenian Kingdom of Commagene, in the north, and the Jewish Hasmonean Kingdom in the south. 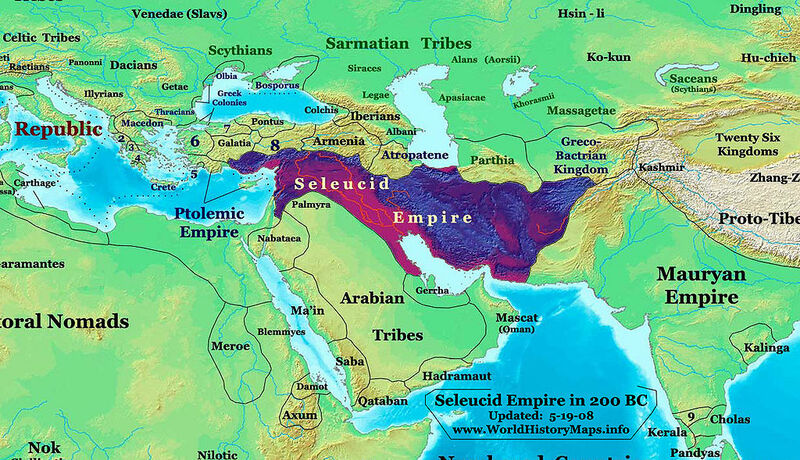 Seleukeia, would eventually fall under Roman rule in 64 B.C., during the Third Mithridatic War .While those in the Southern Levant would gradually be absorbed into the Roman State. Eventually, in 135 A.D., after the Bar Kokhba revolt the North and South were merged into the Roman province of Syria Palaestina, which existed until about 390 A.D. . In the Roman East, Greek and Aramaic continued to be the popular means of communication . However, it was under the Romans, that the re-conceptualizing of the ‘Syriac’ ethnos took place. Unlike the Seleucids, the Romans did away with the distinction between Greek and Syriac civic communities. Thus, allowing Hellenized Syriacs access to Greek citizenship, thereby becoming, in a sense, ‘legitimately Greek’ . The population of Syria Palaestina in the north consisted of a mixed Polytheistic population of Phoenicians, Greeks, and Romans, which formed the majority. In the East, it was linguistically mixed , however, Arameans, Assyrians , and Nabateans made up the majority. In the South, Samaritans , Jews, Greco-Syrians, and Romans made up the majority. Proportions of which changed from the 1st to the 4th century, especially for Jews and Romans . Across the Roman Levant, two kinds of Roman colonies were established. The first were veteran colonies, such as Berytus, Acco-Ptolemias, Heliopolis, and Aelia Capitolina . These types of colonies received veterans from the Roman legions which settled and received land. 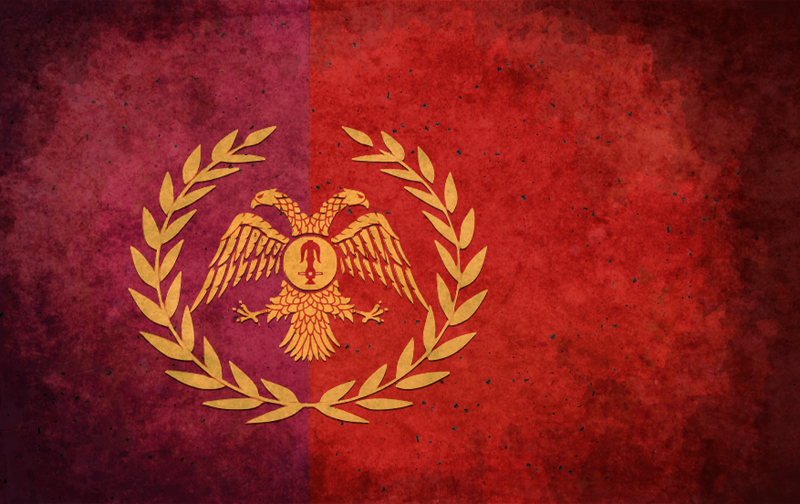 Eventually forming a local Roman elite imposed upon the existing Greek and Aramean communities. The second were titular colonies, like Caesarea-on-the-Sea, Bostra, and Gerasa. These colonies were established through political reorganization, and were not accompanied by the settlement of veterans or other foreigners . Archaeological evidence and written accounts confirm that Helleno-Syrioi perceived themselves to be of genuine Hellenic ancestry . They did not conceptualize themselves as “hybrids’, but as fully Greek and fully Syrian, with certain points of sameness and difference from other ethnic Greeks, and local Syriacs . Numerous cities such as Tarsus, Aradus, Trachonitis, Scythopolis-Beth Shean , and Gaza all had oral traditions proving their Hellenic credentials. During the Crisis of the Third Century, a splinter state broke away from the Roman Empire centered at Palmyra. At its greatest height, the Palmyrene Empire encompassed the Roman Provinces of Syria Palaestina, Arabia Petraea, Egypt, and large parts of Asia Minor. The Empire was ruled by the Greco-Aramean Queen Zenobia, who ruled as a regent for her son Vaballathus. She belonged to a family with Aramaic names , but claimed descent from the Seleucid line of the Cleopatras and the Ptolemies . In many ways, the Palmyrene Empire was a Greco-Aramean kingdom. The chief counsellor to Zenobia was the Greek Cassius Longinus. According to Chase F. Robison and Warwick Ball, Zenobia’s imperial status declaration was aimed toward Rome’s throne instead of Palmyrene independence  . She was walking in the steps of Vespasian, who ascended to the Roman throne after building his power in Syria . While Ferdinand Lot believes that it was a Palmyrene movement aimed toward independence , which is an almost universal view amongst Arabist and Syrianist scholars such as Philip Khuri Hitti  . The first Christians, as described in the first chapters of the Acts of the Apostles, were all Jewish, and referred to by historians as the Jewish Christians. The earliest followers of Jesus composed an apocalyptic, Second Temple Jewish sect, which historians refer to as Jewish Christianity. The first part of the period, during the lifetimes of the Twelve Apostles, is called the Apostolic Age. In line with the Great Commission attributed to the resurrected Jesus, the Apostles are said to have dispersed from Jerusalem, and the missionary activity spread Christianity to cities throughout the Hellenistic world and even beyond the Roman Empire. The Church of Antioch traces its origins to the Christian community founded in Antioch, which later became one of the five major patriarchates or Pentarchy of the state church of the Roman Empire. According to Acts 11:19-26, the Christian community at Antioch began when Jewish Christians who were scattered from Jerusalem because of persecution fled to Antioch. They were joined by Hellenistai from Cyprus and Cyrene who migrated to Antioch . It is in Antioch that they made the “innovation” of addressing not merely Jews, but also Ethnikoi (see Godfearers for the historical background). It was in Antioch that the followers of Jesus were first referred to as Christians . Thus, the Church of Antioch was founded by a mixture of Hellenistai, and Ethnikoi . 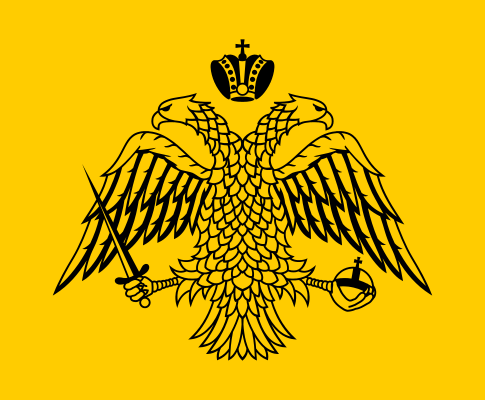 The flag used by the Greek Orthodox Church. Throughout the Middle Ages, Helleno-Syrioi, as well as other Byzantine Greeks self-identified as Romaioi or Romioi (Greek:Ῥωμαῖοι, Ρωμιοί, meaning “Romans” or "Christian Greeks") or Ethnikoi (Greek: ΕΘΝΙΚΟΙ, meaning “Gentiles” or "Polytheistic Greeks”). Helleno-Syrioi contributed to both ethnic Greek religious identities with Levantine Romioi such as John Chrysostom, George of Antioch, and Theodoret. As well as Levantine Ethnikoi such as Libanius, Calliopius of Antioch, and Damascius. Linguistically, they spoke Byzantine or Medieval Greek, known as “Romaic” which is situated between the Hellenistic (Koine), and modern phases of the language. The Romaic-Syrioi or Antiochian-Greeks, like all Romioi were, and perceived themselves as, the descendants of their classical Greek forebears, the political heirs of imperial Rome, and followers of the Apostles. The homeland of the Antiochian-Greeks was a diocese of the late Empire called the Diocese of the East (Greek: Ἑῴα Διοίκησις). 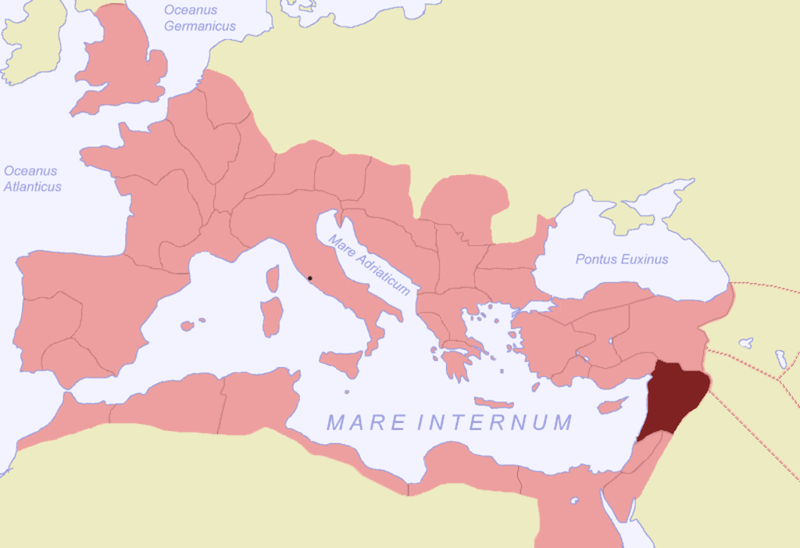 It was subordinate to the praetorian prefecture of the East, and was one of the major commercial, agricultural, religious, and intellectual areas of the Empire. Its capital was Antioch, and it traditionally included the provinces of : Isauria, Cilicia, Cyprus, Euphratensis, Mesopotamia, Osroene, Syria Coele, Phoenice, Palaestina Prima, Palaestina Secunda, and Arabia. During the Byzantine-Sasanian War of 602-628, the entire area of the former diocese came under Sassanid occupation, but was eventually liberated by the Emperor Heraclius. By the end of the conflict both sides had exhausted their human and material resources. Consequently, they were vulnerable to the sudden emergence of the Islamic Rashidun Caliphate, whose forces invaded both empires only a few years after the war. The Byzantine Levant was irreversibly lost to the Arabs after the Battle of Yarmouk, and the fall of Antioch. Disputes over the Christology of the Fourth Ecumenical Council at Chalcedon—the Monophysite controversy— in 451 led to a schism within the Church of Antioch, which at that same council was elevated to the status of a patriarchate. The larger group of Aramaic-speaking members of the Church of Antioch repudiated the council , and became the Syriac Orthodox Church (also called the "Jacobites" for Jacob Baradeus, an early bishop of theirs who did extensive missionary work in the region). They currently constitute part of the Oriental Orthodox communion and maintain a Christology somewhat different in language from that of Chalcedon. The remainder of the Church of Antioch, primarily local Greeks or Hellenized sections of the Syriac population, remained in communion with Rome, Constantinople, Alexandria, and Jerusalem. This is the current Greek Orthodox Patriarchate of Antioch and All the East which is considered by the other bishops of the Orthodox Church to be the sole legitimate heir to the see of Antioch. 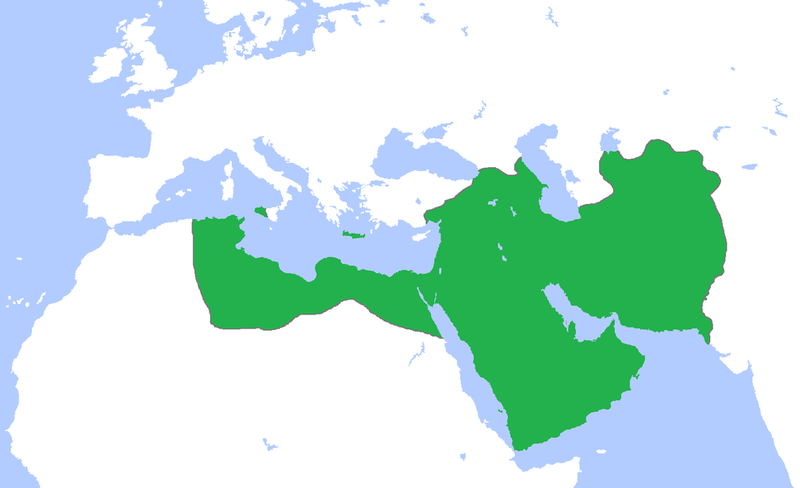 The Arab conquest of Syria (Arabic: الفتح الإسلامي لبلاد الشام) occurred in the first half of the 7th century  by the Rashidun Caliphate, and refers to the conquest of the Byzantine Diocese of the East, which later became known as the Islamic Province of Bilad al-Sham. It was not a large-scale migration of Arab tribes to the Levant or Mesopotamia . On the eve of the Arab conquests the Byzantine Greeks were still in the process of rebuilding their authority in the Levant, which had been lost to them for almost twenty years. At the time of the Arab conquest, Bilad al-Sham was inhabited mainly by local Aramaic-speaking Christians, Ghassanid Arabs and Nabateans, as well as Antiochian-Greeks (Rûm), and by non-Christian minorities of Jews, Samaritans, and Ethnikoi. The population of the region did not become predominantly Muslim and Arab in identity until nearly a millennium after the conquest. Map detailing the route of Muslim invasion of central Syria. 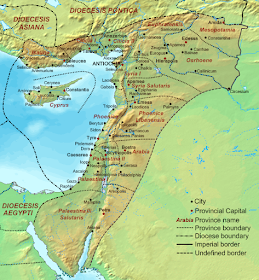 The Arab conquest of the Byzantine Levant began in the south. Damascus was the first major city to fall into the hands of the Arabs on September 19, 634 A.D. Within a year the cities of Sidon, Arqa, and Beirut were all under Arab occupation. By November of 636 A.D., the Arabs had attacked Jerusalem. For four months the siege continued. Ultimately, the Greek Orthodox Patriarch of Jerusalem, Sophronius, agreed to surrender Jerusalem to Caliph Umar in person. Caliph Umar, then at Medina, agreed to these terms and traveled to Jerusalem to sign the capitulation in the spring of 637. Sophronius also negotiated a pact with Caliph Umar, known as the Umariyya Covenant or Covenant of Omar, allowing for religious freedom for Christians in exchange for jizya, a tax to be paid by conquered non-Muslims, called "dhimmis”  , the majority of Palestine population about 300,000-400,000 inhabitants, was still Jewish . In the aftermath a process of cultural Arabization and Islamization took place, combined with Arab immigration to Palestine led to the adoption of the Arabic language and conversion of the part of local population to Islam . With the southern and central Levant now under Arab control. The Rashidun Caliphate turned its sights on Antioch, and the north. The Arab forces marched north, conquering other portions of the Levant. They penetrated into northern Syria near its borders with Anatolia intending to capture Antioch, and to secure the conquered lands from any possible threat from the north. After the conquest of Aleppo, Abu Ubaidah ibn al-Jarrah sent a column under Malik al-Ashtar to capture Azaz in Northern Syria, east of the Taurus Mountains. The capture and clearance of Azaz was essential to ensure that no large Byzantine forces remained north of Aleppo, from where they could strike at the flank and rear of the Arab army during the operation against Antioch . For Antiochian-Greeks, life under Arab occupation was one of isolation . Associated with the Caliphate’s enemies, Antiochian-Greeks experiences a period of persecutions, which led to multiple vacancies or non-residence of the Antiochian-Greek Patriarchal throne during the 7th and 8th centuries. As a result, Antiochian-Greeks increasing identified as Romioi. During those periods of non-residence, the Antiochian-Greek patriarch resided in Constantinople . This continued into the 8th century until the Abbasid Caliph intervened, ordering that the patriarch had to be a native born Romios residing within the Caliphate . Initially, Antiochian-Greeks did not feel that their cultural existence was in danger. Especially, since the region had just lived through a brief Persian occupation. This view point may have also been supported by the fact that Churches continued to function initially. In fact, new churches were erected in the seventh and eighth centuries. Archaeological evidence suggest that Antiochian-Greek culture continued to flourishing . According to the historian James William Parkes, during the 1st century after the Arab conquest (640–740), the caliph and governors of Syria and Palestine ruled entirely over Christian and Jewish subjects. He further states that apart from the Bedouin in the earliest days, the only Arabs west of the Jordan were the garrisons . The Arab garrisons were kept apart in camps, and life went on much as before for the local population. The taxes instituted were the kharaj – a tax that landowners and peasants paid according to the productivity of their fields – as well as the jizya – paid by non-Muslims in return for protection under the Muslim state and exemption from military service. The Byzantine civil service was retained until a new system could be instituted; therefore, Greek remained the administrative language in the new Muslim territories for over 50 years after the conquests. In fact, written Greek was privately used, in different cases, until the late eighth century . Under the Umayyad Caliphate, Antiochian-Greeks held prominent positions, some of whom belonged to families that had served in Byzantine governments. In fact, many Christians managed to rise to high levels in Islamic society. While Islam may have officially regarded Christians as second-class citizens, the reality was that the new Arab conquerors knew nothing of administering a far-flung empire, and so turned to Christians to help run things . In 722 A.D. there were still 3.8 million Christians in Syria out of a population of 4 million . The Umayyads were involved in frequent battles with the Byzantine Greeks without being concerned with protecting themselves in Syria, which had remained largely Christian like many other parts of the empire . The employment of Christians was part of a broader policy of religious tolerance that was necessitated by the presence of large Christian populations in the conquered provinces, as in Syria. This policy also boosted Muawiya's popularity and solidified Syria as his power base  . 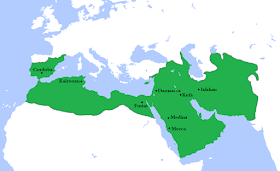 The Abbasid Caliphate was the third of the Islamic caliphates to succeed the Islamic prophet Muhammad. The Abbasid dynasty descended from Muhammad's youngest uncle, Abbas ibn Abd al-Muttalib (566–653 CE), whose name was the derivation of the caliphate. 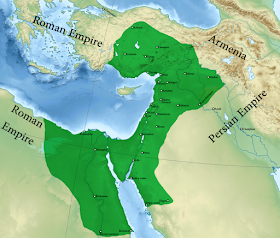 They ruled as caliphs, for most of their period from their capital in Baghdad in modern-day Iraq, after taking back authority of the Muslim empire from the Umayyads in 750 B.C. It was during this period that Christians (particularly Nestorian Christians) began translating works of Greek philosophers to Syriac and afterwards to Arabic, which resulted in the Islamic Golden Age, when much of the Muslim world experienced a scientific, economic, and cultural explosion. In 855 A.D., Christians in Homs revolted and their leaders were crucified at the city gates . By the 9th century, many churches had become mosques, and by about 900 A.D., half the Levantine population was Muslim . The emergence of the Macedonian dynasty in 867 A.D., as well as a strong and unified Byzantine leadership lead to a resurgence of the Byzantine Empire. Emperor Basil I revived the Byzantine Empire into a regional power, during a period of territorial expansion, making the Empire the strongest power in Europe, with an ecclesiastical policy marked by good relations with Rome. Under John Kourkouas, the Byzantines conquered the emirate of Melitene, along with Tarsos the strongest of the Muslim border emirates, and advanced into Armenia in the 930s; the next three decades were dominated by the struggle of the Phokas clan and their dependants against the Hamdanid emir of Aleppo, Sayf al-Dawla. Al-Dawla was finally defeated by Nikephoros II Phokas, who liberated Cilicia and northern Syria and recovered Crete. His nephew and successor, John I Tzimiskes, pushed even further south, almost reaching Jerusalem, but his death in 976 A.D. ended Byzantine expansion towards Palestine. In 969, Antioch was recovered for the Byzantine Emperor Nikephoros II Phokas by Michael Bourtzes and the stratopedarches Peter. During the same year, the Greek Orthodox Patriarch of Jerusalem, John VII, was put to death for treasonable correspondence with Byzantine Emperor Nikephoros II Phokas. Antioch soon became the seat of a doux, who commanded the forces of the local themes and was the most important officer on the Empire's eastern border held by such men as Nikephoros Ouranos. Meanwhile, Jerusalem grew in importance to Muslims and pilgrimages increased, tolerance for other religions declined. Christians were persecuted. Churches were destroyed. The sixth Fatimid caliph, Caliph Al-Hakim (996–1021), who was believed to be "God made manifest" by the Druze, destroyed the Holy Sepulchre in 1009. This powerful provocation started the near 90-year preparation towards the First Crusade . In 1078, Philaretos Brachamios, an Armenian seized power. He held Antioch until the Seljuk Turks captured it from him in 1084. The Sultanate of Rum held it only fourteen years before the Crusaders arrived. In 1071 the Byzantine army was defeated by the Muslim Seljuk Turks at the Battle of Manzikert, resulting in the loss of most of Asia Minor. The situation represented a serious existential threat for the Byzantine Empire. The Emperor sent a plea to the Pope in Rome to send military aid with the goal of restoring the formerly Christian territories to Christian rule. The result was a series of western European military campaigns into the eastern Mediterranean, known as the Crusades. Many of these Crusaders often had their own selfish agendas, chiefly the building up of their own fortunes. When they were successful in seizing territory from the Muslims they would set up their own principalities rather than restore the native Christians to power. They did the same in regards with the Church, often replacing Antiochian-Greek bishops and patriarchs with Latins. 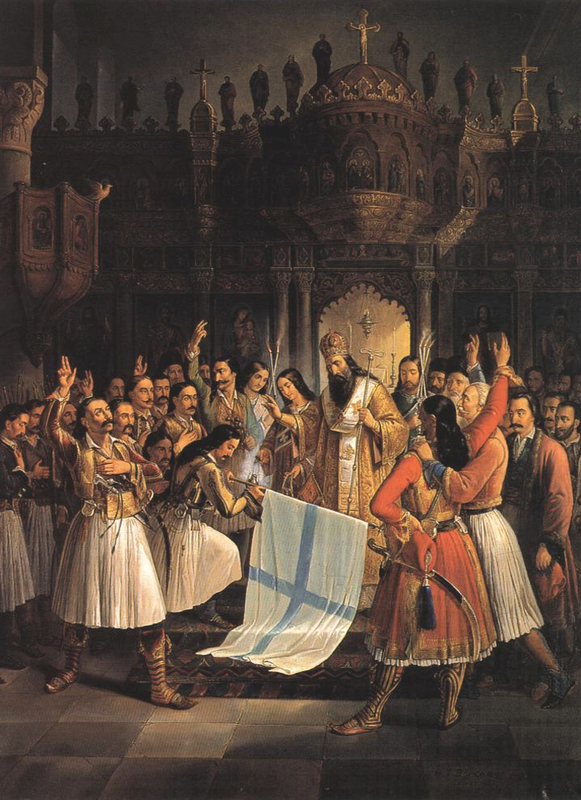 As a result the Greek hierarchy in the Middle East was forced to take refuge in Constantinople once more, fostering an even greater sense of identity than before. They now had the Latins as well the Muslims as their common enemy . 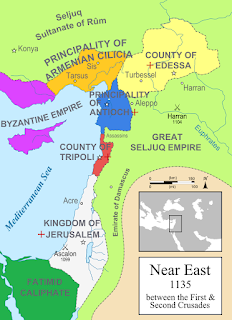 In 1098, Crusaders took Antioch and set up a Latin Patriarchate of Antioch to adorn its Latin Kingdom of Syria, while an Antiochian-Greek patriarchate continued in exile in Constantinople. 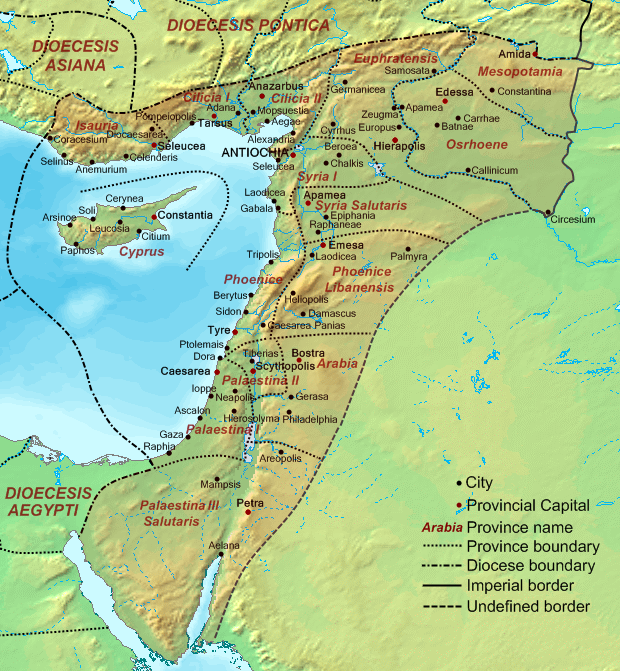 After nearly two centuries of Crusader rule, the Egyptian Mamelukes seized Antioch in 1268, and the Antiochian-Greek Orthodox patriarch, Theodosius IV, was able to return to the region. By this point, Antioch itself had been reduced to a smaller town, and so in the 14th century Ignatius II transferred the seat of the patriarchate to Damascus, where it remains to this day, though the patriarch retains the Antiochian title. In 1516, Ottoman Sultan Selim I defeated the Mamluk Empire in the Ottoman–Mamluk War of 1516–1517, as a result the Levant was annexed into the growing Ottoman Empire. For the first time since the Byzantine Empire, all Romioi were united under one political authority, the Ottoman Sultan. For Antiochian-Greeks, this mean being reunited with other Romioi as part of the Rum Millet (millet-i Rûm), or “Roman nation” by the Ottoman authorities . In fact, the Ottomans viewed the Antiochian-Greeks not only as “spiritually” a part of the Rûm Millet, but ethnicity as well, despite them no longer speaking Romaic (Rumca) . Constantinople once again became not only the political capital, but also the religious capital for all Greek Orthodox Christians. The Ecumenical Patriarch was given complete authority over the entire Rûm Millet, and its religious hierarchy. By 1724, under the influence of the Uniatism ecclesial movement, the Antiochian-Greek community had divided into two distinct and conflicting parties. One fraction of the faithful leaned towards Constantinople (the Aleppines), while the other fraction leaned towards Rome (the Damascians). During the election of Patriarch of Antioch in 1724, a controversy developed over the results. Fearing for the preservation of Orthodoxy and their identity, Aleppine-parishioners and bishops appealed to the Phanar, which appointed a Romaic-conscious Patriarch, Sylvestros the Cypriot. The defeat of the Damascian candidate Kyrillos VI Tanas by Sylvestros resulted in a double lineage of patriarchs, one Rûm-Orthodox and the other Rûm-Catholic Christians, of which the Rûm-Catholic Patriarchs were obliged to reside in Lebanon under the protection of local emirs . on the outset of the national revolt against the Turks on 25 March 1821. As soon as the Greek revolution commenced, Rûm throughout the Empire were targeted for persecutions, and Syria did not escape Turkish wrath . In all the major Syrian cities, Rûm were seized, tortured, and killed. Even remote villages did not escape, as soldiers were constantly searching the countryside for any signs of sympathy with the revolutionaries in Greece . Fearing that the Rûm of Syria might aid the Greek Revolution, the Porte issued an order that they should be disarmed . In Jerusalem, the city’s Christian population, who were estimated to make up around 20% of the city's total  (with the majority being Rûm), were forced by the Ottoman authorities to relinquish their weapons, wear black, and help improve the city's fortifications. While in Latakia, Rûm attempted to hide their weapons. “The arms were deposited secretly at the house of a Christian, and were placed in a coffin. On the appointed day, a funeral procession started from the house to convey the coffin to the burial-vaults of the Christian cemetery. The plot was betrayed. The Mohammedans stopped the procession in the street, opened the coffin, and found the arms concealed. Then commenced one of the most fearful persecutions ever recorded. Those Christians who could elude the vigilance of the Mohammedan guards, escaped into the open country; but large numbers fell into the hands of the Moslems, and were imprisoned, tortured, and slain, at the will of their fanatical captors” . 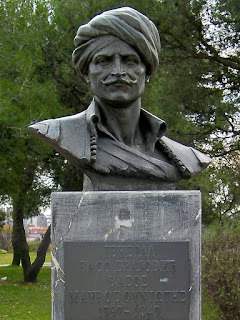 Monument to Vasos Mavrovouniotis in Podgorica. Greek Orthodox holy sites, such as the Monastery of Our Lady of Balamand, located just south of the city of Tripoli in Lebanon, were also subjected to vandalism and revenge attacks, which in fact forced the monks to abandon it until 1830 . Not even the Greek Orthodox Patriarch of Antioch was safe, as orders were received just after the execution of the Ecumenical Patriarchate in Constantinople to kill the Antiochian Patriarch as well, however, local officials failed to execute the orders . As the revolution raged on, an Antiochian-Greek priest traveled to Greece to plead for assistance from Ioannis Kolletis to help the Antiochians revolt. Although seen as an excellent idea, Kolletis was unable to directly aid the Antiochians. Therefore, Kolletis told the priest to seek aid from Vasos Mavrovouniotis, who with the assistance of other Greek Revolutionaries such as Nikolaos Kriezotis, and Hatzimichalis Dalianis, took up the cause. On March 18th, 1826 a flotilla of around fifteen Greek ships, led by Mavrovouniotis and Kriezotis attempted to spread the Greek Revolution to the Ottoman Levant. According to then-British Consul John Barker , stationed in Aleppo, in a memo to British Ambassador Stratford Canning, in Constantinople. The Greek Revolutionaries landed in Beirut  , but were thwarted by a local Mufti and a hastily arranged defense force. Although initially repelled, the Greeks did manage to hold on to a small portion of the city near the seashore in an area inhabited by local Rûm. During which they appealed to the Rûm “to rise up and join them” , and even sent an invitation to the chief of the local Druzes to also join the Revolution. A few days later, on March 23, 1826 the regional governor Abdullah Pasha sent his lieutenant and nearly 500 Albanian irregular forces to exacted revenge for the failed uprising . As panic set in across the Levantine Rûm community, for fear of persecution due to the Greek Revolution. Aleppo’s Rûm Catholics saw an opportunity to protect themselves from attack, and petition the Porte for autonomy so that they could free themselves from the authority of the Greek Orthodox Patriarchate. On April 16, 1821 a delegation from the Rûm Catholic community from Aleppo went before the local chief judge to swear allegiance to the Sultan, so as to entice the Ottoman authorities into recognizing the Rûm Catholics as their own millet. In order to convince the obviously skeptical judge, the delegations gained the support of local Muslim notables and openly embraced Arabism  .In 1822, the Porte recognized  the Rûm Catholic community of Aleppo, granting them autonomy and the right to collect taxes on all the Rûm of Aleppo , not out of any consideration for the Rûm Catholic as different from the Rûm Orthodox, but more so to punish the Ecumenical Patriarch for the Greek Revolution . In 1848, the Porte officially recognized the Rûm Catholic community as its own millet. On October 17-18, 1850 Muslim rioters attacked the Christian neighborhoods of Aleppo. 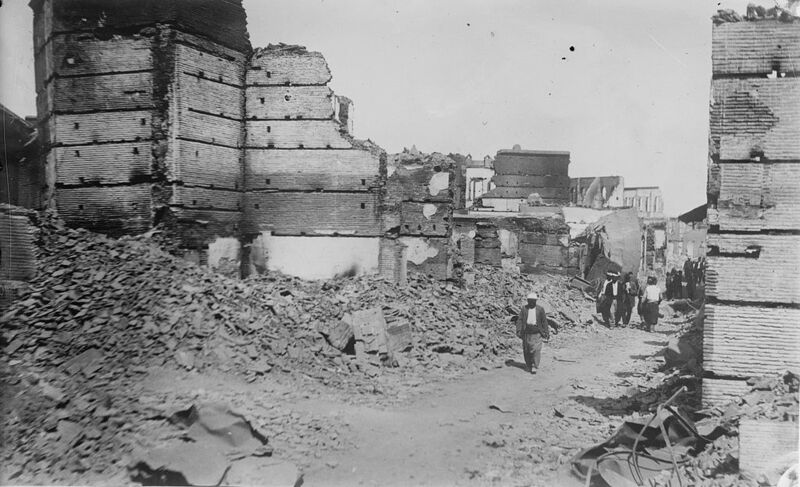 In the aftermath, Ottoman records show that 688 homes, 36 shops, and 6 churches were damaged, including the Rûm Catholic patriarchate and its library. The events lead hundreds of Christians to emigrate mainly to Beirut and Smyrna. On July 10th, 1860 Saint Joseph of Damascus and 11,000 Rûm Orthodox and Catholic Christians    were killed when Druze marauders destroyed part of the old city of Damascus. The Antiochians had taken refuge in the churches and monasteries of Bab Tuma (“Saint Thomas’ Gate”). The Massacre was a part of the 1860 Druze–Maronite conflict, which began as a Maronite rebellion in Mount Lebanon, and culminated in the massacre in Damascus. Through their agents, consuls and schools, the Russians nurtured Arabism in the Levant . They sought to distort the image of the Romaic-conscious clergy in the eyes of the common Arabized Rûm in preparation for expelling those few Rûm that maintained a Romaic identity from the Antiochian-Greek Patriarchate. The book ‘Lamha tarikhia…’(Historic summary of the Greek Brotherhood of the Holy Sepulcher) asserted Russia’s hidden intentions to liquidate the Greek presence in Syria and to Arabize the Antiochian Church . As relations deteriorated between those Romaic-conscious Rûm and Arabized Rûm. Russia started to replace Romaic-speaking clergy with Arabists who were loyal to it and the Tsar  . In the end, Russia scored an all-out victory in Arabizing the Antiochian-Greek Patriarchate and installing the first Arabist patriarch  . On November 13th, 1899 in the presence of the Arabist bishops and the Russian Consul and his staff. Meletius II (Doumani) of Antioch was appointed Patriarch of Antioch and all the East, becoming the first Arabist primate of the Church of Antioch . In response, the Patriarchs of the Phanar, Jerusalem, and Alexandria did not recognize the Russian-puppet Meletius II as patriarch, and refused to exchange with him the messages of peace . A street in the Christian quarter of Adana, photographed in June 1909. The Adana massacre occurred in the Adana Vilayet in April 1909. The massacre of Christians in the city of Adana amidst the Ottoman countercoup of 1909 resulted in a series of anti-Armenian pogroms throughout the district. Reports estimated that the massacres in Adana Province resulted in the deaths of as many as 20,000-30,000 Christians. The vast majority of which were Armenians, followed by roughly 1,000 Assyrians, and 250 Antiochian-Greeks . 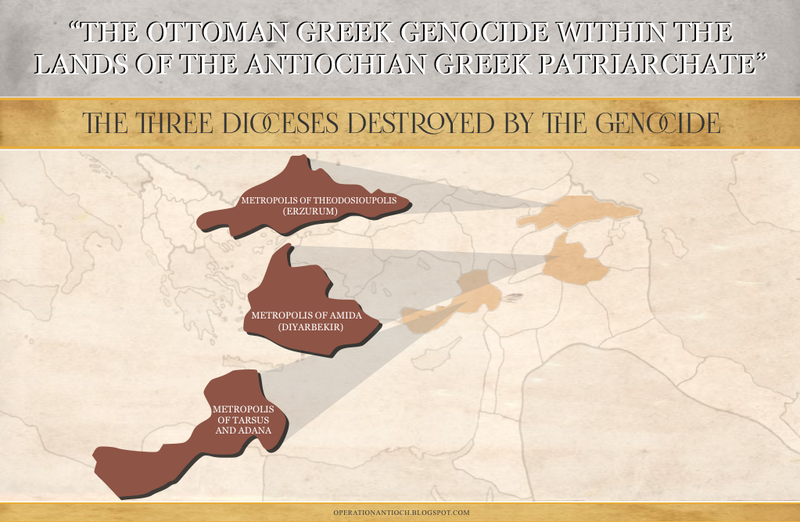 During the First World War, Antiochians, alongside other Ottoman Greeks, were targeted by the Ittihadist Ottoman authorities in what is now historically known as the Ottoman Greek Genocide  . The Genocide commenced in 1914 with an economic boycott of Greek businesses, which was soon followed by a policy of deportations. For Antiochians, this was first felt in Cilicia, around Mersin, Tarsus, and Adana . In April 1918, seventy Antiochian-Greek notables from Tarsus were exiled to the district of Aleppo . In the Levant, specifically around Mount Lebanon in the districts of Byblos, Betroun, and Tripoli an estimated 100,000-250,000 Maronites and Antiochians died of starvation and disease  . According to Issam Khalifeh, a professor of history at the Lebanese University, the Turks feared the Christians in Mount Lebanon would support the Allies “so they had to starve them before they were armed” . In order to achieve this, Djemal Pasha instituted an internal blockade of Mount Lebanon. This deliberate policy towards the Maronites and Antiochians, combined with the Allied blockade of the Mediterranean and a massive locust attack are often called the Great Famine of Greater Syria. In a letter dated May 26, 1916, Jubran Khalil Jubran wrote Mary Haskell, “The famine in Mount Lebanon has been planned and instigated by the Turkish government. Already 80,000 have succumbed to starvation, and thousands are dying every single day. The same process happened with the Christian Armenians and applied to the Christians in Mount Lebanon” . In the aftermath of the Genocide, those Antiochian-Greeks living outside of the French Mandate for Syria and the Lebanon were subject to the forced population exchange of 1923. As a result, three Antiochian Greek Orthodox Dioceses were completely annihilated; the Metropolis of Tarsus and Adana , the Metropolis of Amida, and the Metropolis of Theodosioupolis. Originally ceded to France in the Treaty of Sevres, Cilicia, fell under Turkish-occupation again with the Treaty of Ankara in October 1921. Fearful of continued Turkish persecutions, Christians began a mass exodus. After the signing of the Treaty of Lausanne, between Greece and Turkey, 10,000 Antiochian-Greeks left the province of Adana and resettled permanently in Greece . One Modern Greek town, which is made up of Antiochian survivors from the population exchange is Nea Selefkia , which is located in Epirus. The founders of Nea Selefkia were refugees from Silifke in Cilicia. At the end of the First World War, the Ottoman Levant and Mesopotamia came under Allied control. In accordance with the Sykes-Picot Agreement, between Britain and France during the war, the British were given control of most of Ottoman Mesopotamia, and the southern part of the Ottoman Levant, while the French were given control of the rest of the Ottoman Levant. The region was subdivided into six states. They were the States of Damascus (1920), Aleppo (1920), Alawites (1920), Jabal Druze (1921), the autonomous Sanjak of Alexandretta (1921), and the State of Greater Lebanon (1920). It took France three years from 1920 to 1923 to hold full control over the Levant, and quall all the insurgencies that broke out, notably in the Alawite territories, Mount Druze, and Aleppo. 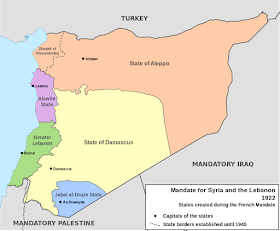 In 1923, French control of these territories was formalized by the League of Nations’ mandate system, and France was assigned the League of Nations mandate for Syria and Lebanon, on September 29, 1923. 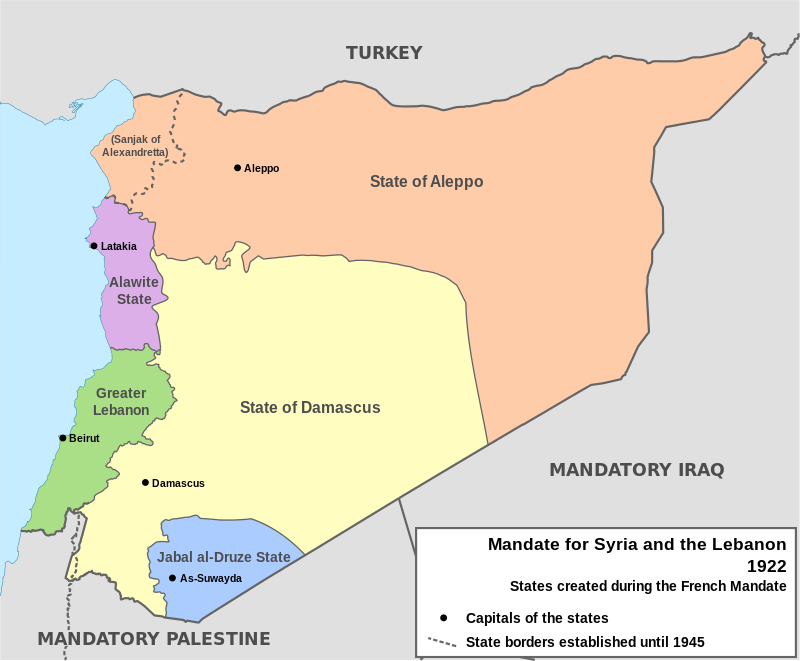 The administration of the region under the French was carried out through a number of different territories, including the Syrian Federation (1922–24), the State of Syria (1924–30) and the Syrian Republic (from 1930), as well as the State of Greater Lebanon. 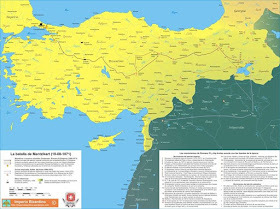 From September 7, 1938 to June 29, 1939, the Sanjak of Alexandretta of the French Mandate of Syria existed as a political entity known as the Republic of Hatay. 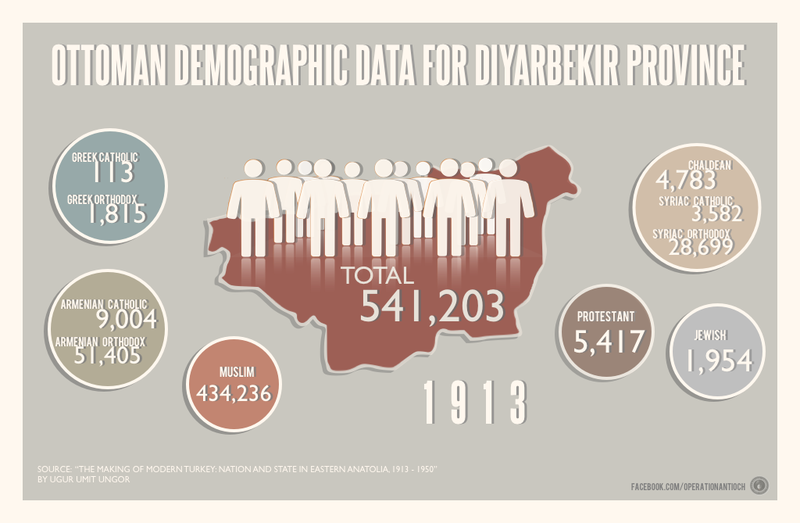 The state was transformed de jure into the Hatay Province on July 7, 1939, and joined Turkey de facto on July 23, 1939. 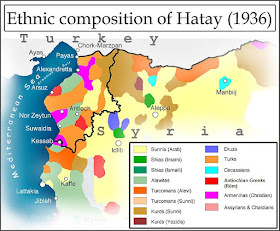 The annexation of Hatay into a Turkish province rigged referendum, which was held as a way for the French to allow the Turks to take over the area, hoping they would turn on Hitler . For the referendum, Turkey crossed tens of thousands of Turks into Hatay to vote . Throughout the late 19th century, beginning in the 1860s, a sense of loyalty to the ‘Fatherland” developed in intellectual circles in the Levant, but not necessarily an “Arab Fatherland”. Until the 19th century, Arab ethnic consciousness was found only within the Sunni Muslim population. During this period, a heavy influx of Christian missionaries and educators from Western countries provided what was termed the “Arab political revival”, resulting in the establishment of secret societies within the Ottoman Empire. In the 1860s, Muslim literature produced in the Levant and Mesopotamia, which was under Ottoman control at the time, contained emotional intensity and strongly condemned the Ottoman Turks for “betraying Islam” and the Fatherland to the Christian West. In the view Arabists, Islam had not always been in a “sorry state” and attributed the military triumphs and cultural glories of the Arabs to the advent of the religion, insisting that European modernism itself was of Islamic origin. At the same time, Christian literature began promoting a mix of Arabism, Pan-Syrianism, and other regional ideologies. The result of a combination of things. The first being the general atmosphere within the Christian communities, which had just witnessed massacres throughout the early and middle 19th century. The thought of a secular identity free of religious persecution appealed to Christian intellectuals. Adding to this type of thinking were Protestant missionaries who had established universities throughout the Levant, as well as Russian diplomats who fostered Arabist sentiment . In 1911, Muslim intellectuals and politicians from throughout the Levant formed al-Fatat ("the Young Arab Society"), a small Arabist club, in Paris. 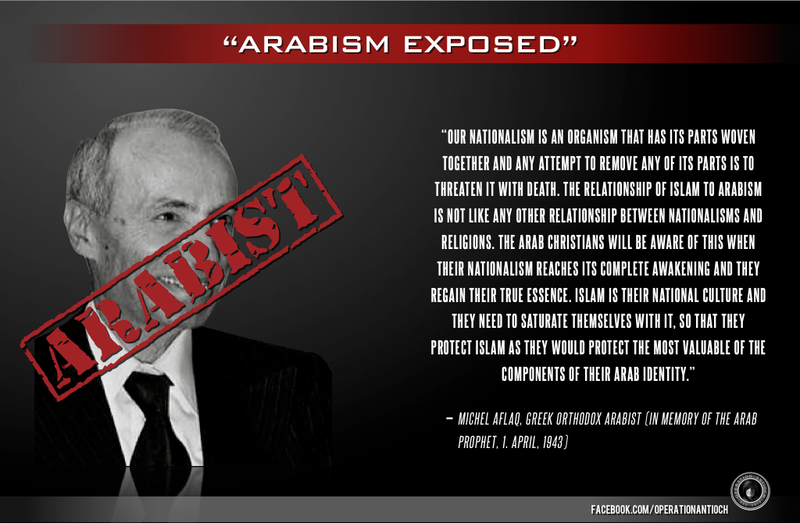 Its stated aim was "raising the level of the Arab nation to the level of modern nations." In the first few years of its existence, al-Fatat called for greater autonomy within a unified Ottoman state rather than Arab independence from the empire. Al-Fatat hosted the Arab Congress of 1913 in Paris, the purpose of which was to discuss desired reforms with other dissenting individuals from the Arab world. During the First World War, the British promoted Arabism as a political weapon against the Ottoman Empire. Adopted by Sharif Hussein ibn Ali, the Sharif of Mecca, who sought the establishment of a new Caliphate to replace the Ottoman Empire. In 1915–16, the Hussein-McMahon Correspondence resulted in an agreement between the United Kingdom and the Sharif that if the Muslims revolted successfully against the Ottomans, the United Kingdom would support claims for a new Caliphate. In 1916, however, the Sykes-Picot Agreement between the United Kingdom and France determined that parts of the Levant and Mesopotamia would be divided between those powers rather than forming part of an Islamic Caliphate. During the French Mandate of Syria and Lebanon, one of the leading supporters of Arabism was the Soviet Union. The Soviets continued the Czarist Russian agenda of Arabism, now with a Marxist slant against Western Imperialism via the Antiochian Patriarchate. It should be of no surprise that many of the early Arabist were in fact Antiochians. A more formalized Arabist ideology than that of Hussein was first espoused in the 1930s, notably by Arabist thinkers such as Constantin Zureiq, Zaki al-Arsuzi and Michel Aflaq. Aflaq and al-Arsuzi were key figures in the establishment of the Arab Ba’ath (Renaissance) Party, and the former was for long its chief ideologist, combining elements of Marxist thought with a nationalism to a considerable extent reminiscent of nineteenth-century European romantic nationalism. It's been said that Arsuzi was fascinated with the Nazi ideology of "racial purity" and impacted Aflaq   . The Antiochian Greek identity developed within a specific geocultural environment, which corresponds with the jurisdictional boundaries of the Greek Orthodox Patriarchate of Antioch, and interestingly also the former boundaries of Coele-Syria and the Diocese of the East. The highest concentrations of Antiochian Greek Christians still living in the Levant are found within the territories of Syria, Lebanon, and Turkey. In present-day Lebanon, the Lebanese-Antiochians are found in Beirut, the Southeast (Nabatieh/Beqaa) and North, near Tripoli, Koura and also in Akkar, Batroun, Matn, Aley, Zahlé, Miniyeh-Danniyeh, Hasbaya, Baabda, Marjeyoun, Tripoli, Rashaya, Jbeil and Zgharta. Cities and towns with a majority Lebanese-Antiochian population in Lebanon are Achrafieh, Amioun, Kousba, Anfeh, Deddeh, Kfaraakka, Aaba, Afsdik, Bdebba, Batroumine, Bishmizzine, Btourram, Bkeftine, Bsarma, Btaaboura, Darchmezzine, Fih, Kaftoun, Kelhat, Kfarhata, Kfarhazir, Kfarsaroun, Ras Maska, Miniara, Cheikh Mohammad, Zawarib, Hamat, Douma, Dhour El Choueir, Bteghrine, Mansourieh, Broummana, Kafarakab, Bhamdoun, Souk El Gharb, Marjayoun, Deir Mimas, Rachaya Al Foukhar, Aita al-Foukhar etc. Cities and towns with an important Lebanese-Antiochian minority are Ras Beirut, Tripoli, El Mina, Chekka, Bourj Hammoud, Zahleh, Halba, Batroun, Bikfaya, Baskinta, Antelias, Ras el Matn, Aley, Bechamoun, Machgara, Hasbaya, Kfeir, Niha Bekaa, Rit and others. Achrafieh formerly was ruled by seven socially and economically prominent Antiochian-Greek Orthodox Christian families that formed Beirut's High Society for centuries: Trad, Fernaine, Araman, Bustros, Sursock, Fayyad, Tueini, the list of names had never been certified as some say Boutros ,Jbeili and Geday are among the seven families. While those able to remain in Turkey are concentrated in the Hatay Province, although a significant number of Antiochian Greeks have migrated to Constantinople. Most Levantine Rûm view self-identity as merely a spiritual, not ethnic identity. These Levantine Rûm instead often identify with one of several artificial nationalities created by Western Imperialists after the First World War. These nationalities being Lebanese, Syrian, Palestinian, Jordanian, and Turkish. Within these different nationalities are three competing ethnic identities. The most popular ethnic affiliation for Levantine Rûm is the Arab ethnic identity. This ethnic identity was fostered in the 19th century by American Protestant missionaries, and Russian diplomats. It was accepted by many as a way to prevent religious persecution from Muslims based on a false belief of a common ethnic origin. Arabist Rûm emphasize their descendant from Ghassanids. The second largest ethnic affiliation found amongst Rûm is the Aramean identity. The rise of the Aramean identity within the Rûm began in the 20th century. This ethnic identity has been fostered and supported by Syriac Christians. It is often accepted by Rûm that mistakenly believe that the only ethnic identity that is indigenous to the Levant is Aramean. Arameanist Rûm emphasize their descendant from the indigenous Aramaic-speakers of the Levant. 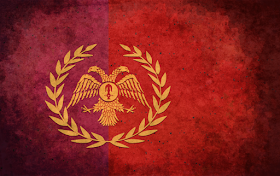 The newest ethnic affiliation for Levatine Rûm is the Hellenic identity. Popular amongst younger educated Rûm. Antiochian-Greeks understand themselves to be a unique and indigenous people descendant from a mix of the Sea Peoples, Macedonian-Greeks, Romans, and Byzantine-Greeks. e-Epanastasi: The Neo-Shu'ubiyya: is it Hellenism's turn?